What is Feline Coronavirus (FCoV)? Feline coronavirus is a common virus which mainly affects the intestinal tract. What are the symptoms of FCoV? In most cases it will cause mild diarrhoea but in some cases, no symptoms at all. Feline coronaviruses are transmitted when ingested, usually through grooming or eating off contaminated surfaces. FCoV is shed in an infected animals feaces and can survive in the environment from several days to a few weeks. The virus can easily be destroyed with a regular disinfectant but where a cat doesn’t show symptoms and a number of cats live together, the virus can spread very quickly. Feline infectious Peritonitis (FIP) occurs when a feline coronavirus mutates. It is not known how or why this occurs in some cats and not others, although it is suggested that it may be due to a poor immune response or immature immune system. Stress brought on by rehoming, overcrowding, medical procedures or a concurrent illness could also increase a cat’s risk of developing FIP. Young cats with an immature immune system are at an increased risk if going on to develop FIP following a FCoV infection. Kittens and young cats under 2 years old are most susceptible to developing FIP. Despite FCoV being a fairly common infection, a relatively small number go on to develop FIP. It is estimated that incidence of FIP in household cats is 1:5000, rising to 1:20 in catteries and households with 5 or more cats. How is FIP in my cat diagnosed? Following a thorough physical examination, the vet will undertake a complete blood count, an IFA or ELISA test to see if coronavirus antibodies are in the cat’s system, a PCR test and a sample of abdominal or thoracic cavity fluid to help diagnose FIP. Although none of these tests will confirm a diagnosis of FIP, a combination of results consistent with FIP, will make a diagnosis of FIP more likely. A biopsy of infected tissue is the only way to confirm a diagnosis of FIP, however, surgery would cause unnecessary stress to the cat and she may be too sick to undergo the procedure anyway. A definitive diagnosis of FIP is often only made on post-mortem examination. Unfortunately, there is no cure for FIP. It is more a case of making your pet comfortable. A cat suffering with dry FIP is likely to be given a course of antibiotics, anti-inflammatories and immunosuppressive medication to relieve symptoms and slow down the progress of the disease, prolonging your pet’s life for a for a few months. 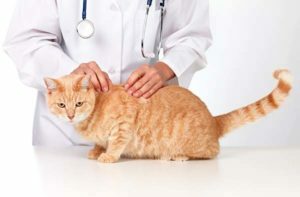 If your cat has been diagnosed with wet FIP, there is no treatment due to the speed the virus spreads through the cat’s system and the damage it causes. Sadly, your vet is most likely to advise pet euthanasia. How can I prevent my cat from developing FIP? There is no vaccine for FCoV or FIP in the UK. A vaccine is available in some other countries, however, it’s poor reliability and the uncommon occurance of FIP, does not generally warrant its use. Once your cat has been infected with FCoV there is no way of knowing whether they will go on to develop FIP. If your cat has FCoV or has been exposed to the virus, taking steps to avoid stressful situations such as vaccinations, neutering or overcrowding, may help prevent the development of FIP.